In 1941 as the US was entering the Second World War, a young lady named Pearl was turning 17. She lived in Daphne but made the trip to Foley each weekend to visit her best friend who lived there. Foley was a hub of military activity in Baldwin County. Between Barin Field, Ft. Morgan and the two POW camps, there was a great number of military men in the area. USO activities were routinely held in the American Legion Post 99 which had come to be known as USO Hall. It is now the home of the Gift Horse Restaurant. Pearl would usually try to hitch a ride with the army supply truck that ran between Daphne and Ft. Morgan on Fridays so that she and her friend Olivia could work the USO dances. She was usually found at the lemonade table. She and the army driver, Joey, soon fell in love and the rest is history. They would dance away the weekends at the USO hall to their favorite song, Glen Miller’s “String of Pearls”. They were very happy until Joey received his orders to go to Europe. As he was about to depart he presented her with a string of pearls as a marriage proposal. They were wed before he left and she moved to Foley to wait for his return. Instead, she received notice that he was missing in action. She never lost hope for his return. She would wander the streets in the blue dress and pearls she wore to see him off. She seemed to lose touch with reality and lived more and more in her memories. She would wander into the skating rink that took the place of the USO hall and later when it became a hardware store she would enter asking if anyone cared for lemonade. She would find her way to the train depot each evening and await her beloved’s return. Eventually, Pearl died a quiet death. Soon thereafter, people began reporting seeing a mist moving down the street that resembled a woman in a blue dress. The hardware store employees reported hearing the haunting strains of Glen Miller and occasionally caught a glimpse of a couple floating on air as they danced. She would be seen on the bench outside the defunct and crumbling train depot. In 1971 the train service ended but a steam engine was run for the bicentennial. Most of the passengers were dressed in colonial garb, but one was wearing a WWII era navy dress. When the City of Foley decided to demolish the depot, John Snook, owner of Gulf Telephone Co. purchased it and moved it to Magnolia Springs, believing the city would one day regret its demise. Of course he was right and the building was returned in 1995 and became the City of Foley Museum. During its 24-year absence, no one reported seeing Pearl. However, now that it is back in its rightful place, a ghostly specter can sometimes be seen on the bench facing the tracks, still awaiting her beloved. We here at Serpents of Bienville have a lot of different projects currently running. One project that we are particularly excited about is the Alabama Oddities pieces that Amanda is writing for our social media sites. She is doing daily updates, bringing you a new story every morning, of something strange and odd from our Southern home. Not everyone has social media, so we will be doing weekly rundown's of her stories, which we will be publishing every Sunday. We hope you guys enjoy, and remember to follow us on our social media sites to get daily Alabama Oddities stories. With the opening of the new Serpents of Bienville Art Gallery we have been a little behind on the rundowns so here's one a day or two late. So enjoy! Here is an early vaccine from Walker County, Alabama. Whooping Cough is a highly contagious respiratory infection, and is known to be fatal for smaller children. This was a serious worry for parents before the life saving vaccine became available in the 1940's. As with most superstitions, the fabled prevention of whooping cough in Alabama grew out of fears from the natural world. Mrs. Lois Pinkard took the medically unsound advice of an elder, worried about her child's health and safety. She says she was told to put a goldfish in her baby's mouth and hold it there until the fish fluttered its tail, then remove the fish and the child would be protected from the infectious disease. Her hesitation was outweighed by the drive to keep her baby safe, so the child opened wide, and mama dropped the goldfish in its mouth. The baby swallowed the fish whole. Mrs. Lois panicked, not knowing if the fish had fluttered long enough for the spell to take hold. She figured it was the effort that really made the difference, because her child never caught whooping cough. Dekalb County children have carried a story through the years, turning this folktale into a household urban legend in Alabama. Jessie talked her parents into leaving her at home by herself overnight with the reassurance that she was safe. Her big dog Mob would protect her to the ends of the earth. Her mother obliged and Jessie and Mob were left alone as the rest of the family crossed the river to spend time with kin. Jessie and Mob finished their chores, ate dinner, and rocked in a chair by the fire. Jessie thought she was listening to the wind whistling in the trees, but Mob began growling. The whistling grew heavier and Mob growled more crazily. Jessie decided to open the door and show her companion that nothing was out to spook him. Mob never wore a leash, because he never left Jessie's side. But tonight, Mob took off as soon as the door cracked open, needing to protect his girl. The sounds Mob created, screeching out from the woods scared Jessie ice cold. Then silence fell hard. When Jessie's family returned the next day, the doors were all locked from the inside. No one answered their knocking. When the family finally broke through the window to unlatch the door, the found Jessie alone, sitting still in her rocker, her hair turned white as a ghost. Mob never returned to her, and she never spoke of what really happened that night. Jessie never again spoke of anything at all. The White Stone is known to bring hardship on those who allow it to reside on their property. A story of its curse is known in Walker County. The couple that owned the farm worked in the field in view from their kitchen window every day, so the wife was surprised to see something standing still smack in the middle of it one morning. She went out in the early fog to check it out, and she found a stark white rock, about three feet tall and egg shaped, tall and still amongst her crops. The husband moved the rock to the flower garden, and the effects of the cursed stone befell the house shortly thereafter. The milk cow ran away, the well dried up, livestock and crops died inexplicably, and the barn caught fire, all within a month's time. When the realization set in that the streak of bad luck started at the discovery of the stone, the husband immediately loaded up the white menace and deposited it at the shore of a shallow creek. The milk cow returned, the well water flowed once more, and the next crop of vegetables were healthier and more plentiful than ever. Another man came across the white stone at the creek and, entranced by its beauty, loaded the cursed thing in his truck only to have it break down on the highway before he could even get it home. The Daphne Museum is an elaborate step back in time, since it is housed inside the antebellum Daphne Methodist Church. At the casting of the original bell that rang from its belfry, Mr. and Mrs. William Jones donated silver dollars to line the inside of the bell because they told it "enhanced the tone." The Daphne Methodist Church held services since the 1840's, with the oldest grave marker found to read from 1847. It now preserves the beauty, history, and heritage of this Jubilee City. If you haven't been lately, I highly recommend it! The museum is open Sunday from 1 til 4! Though many stories of phantom women on bridges, in search of their lost babies, have made their rounds through the circuit of urban legends, the Wild Woman of Pea River has turned up in written accounts linked to the death of Essie Ligon. Essie was an undocumented slave near Sylvan Grove just off the banks of Pea River, and she was fetching water when she heard her baby shriek from the basket where he was previously napping. She climbed as fast as she could back to her child's side, but the basket was empty. She searched every waking moment for years to find her little boy, with no clue to lead her looking. One day, though, fetching water at the same spot on Pea River, she saw a little black boy dressed in native garments, and just knew it was him. She scrambled to cross the river, but at a swell from heavy rains, the current was too much. The water took her. Locals say the Essie Ligon, the Wild Woman of Pea River, will chase cars across the bridge between Opp and Enterprise with a feverish rage, even causing flat tires and electrical problems that keep vehicles from reaching the other side, the side where her baby stood, the place of a reunion that never was. An Amish girl from Ohio with a child growing in her womb knew that she could bring nothing but shame and despair to her family in the early 1900's. She boarded the train one night and never returned to the north. Baldwin County, Alabama was advertised as a land of fertile soil and cheap estate, which sounded like a wonderful place to raise her child and start anew. Single mothers were not treated with any respect at the time, so constructing a story of losing her husband in the Great War, her backstory was covered, and with her broad skill set, employment came easy. Taking up work and residence at the Loxley Hotel, she hid her growing belly under numerous aprons, but the owner caught on quickly. She helped the mother-to-be during her pregnancy and protected the child after its birth. Soon, the kind owner sold the hotel, though, and the new employer was not so understanding. The little girl never left the upstairs room as advised by the mother, and the child would stare out the window all day, longing to play with the children passing through town. When the mother realized that this was no way to raise her child, that the girl deserved more than the confines of this room, the mother began to look for other work. But before the woman could pack up her little girl and start a better life, the influenza epidemic swept heavily through the region. When the woman didn't return to work for tow days, the angry hotel owner marched up to the maids quarters to give her what for, and found her cradling her child in the corner rocking chair, their lives recently slipped away. The rocking chair is now owned by a nearby resident of Loxley, and reports the rocking chair swaying at odd times throughout the day, and if you pass by the old hotel, you can still see the little girl staring out the top right window of the building, longing for companionship, clutching nothing but her doll. We here at Serpents of Bienville have a lot of different projects currently running. One project that we are particularly excited about is the Alabama Oddities pieces that Amanda is writing for our social media sites. She is doing daily updates, bringing you a new story every morning, of something strange and odd from our Southern home. Not everyone has social media, so we will be doing weekly rundown's of her stories, which we will be publishing every Sunday. We hope you guys enjoy, and remember to follow us on our social media sites to get daily Alabama Oddities stories. Enjoy! There is a home on Brookside Drive in Opp, Alabama that the family was drawn to. They moved to Opp in 1988 and were drawn in by it’s beauty and charm so much that the mother asked the elderly woman if they could possibly buy her home from her. She swiftly obliged. As the family of seven moved in, they quickly found out that the number of residents to the home far outnumbered those of the living. The activity started with a man, whose clothes were both too small and too big, standing at the foot of one of the daughter’s bed while she slept. The next sighting was of a little girl in a frilly dress jumping rope in the yard. The youngest girl ran out to find her, but no one was there, though her father always complained about his daughter jumping rope in the house, her swearing she didn't do it. Things turned dark quickly following this incident. Names of anyone present alone in the house would be called, three times, the third being more of a aggressive growl, enough to frighten one of the boys out of the house in nothing but a towel until his parents returned home. The kids would see objects flying across their rooms at night, some even seeming to be on fire or broken into shards, obviously attempting to scare the family out of the house. The family pets weren’t immune either. Doors would slam on the dogs, cats would be thrown from porch swings. The final straw was the most terrifying of all. One of the girls reported something entering her body from her fingertips, crawling under her skin, creeping all the way up to her shoulders, them quickly retracting. She was frozen with fear. When she mustered the courage to roll over to dash to her parents’ bed, a gray skinned man with hollow black eyes was lying on the pillow next to her. When she made it to her parents’ room, her siblings were already there. They moved out in 1998. The family that moved in after them said they hadn't been visited by anything from beyond, but when one of the girls returned to interview the new family, she was aggressively thrown back down the driveway in a ghostly "stay out" manner. Message received. The far reaching shade of an oak tree canopy can provide cover: cover from the blazing sun, cover from the heavy drops of rain, and when the sun has set, the cover of complete darkness, the perfect location for murder. A gnarly knotting oak tree reaches out from the side of the road that lay between Darlington and Camden Highway. On a warm and still night, a man dragged his prey into the cover of this tree, slit his throat, and walked away unseen. The blood ran from the trunk to the road, staining the white sand crimson along its path. The southern rains came, as they do almost daily in the summer, and washed the blood away. The sands remain white, until the rain returns. It is said that the rain now brings the man's blood back to the surface around the roots of the oak, because though the dead man's identity is unknown, he will not let his heinous murder be forgotten. Monuments are erected to commemorate significant markers that hold the utmost historical importance. in Enterprise, Alabama, that important marker is the Boll Weevil. This beetle, indigenous to Mexico, reared it's ugly head in 1915 in Alabama, feasting on cotton crops and leaving a town in devastation. This doesn't seem like a likely candidate for immortalization in iron on Main Street, but the people of Enterprise seem to be the eternally optimistic type. After the cotton crops were destroyed, they thought to diversify their endeavors, which brought in more cash flow than before the boll weevil paid the town a ghastly visit. So in 1919, the town erected the Boll Weevil Monument, but the worm wasn't actually holding a boll weevil until thirty years later, after many eyebrows were raised as to what this statue actually had to do with bugs. Vandals have destroyed the original statue so many times that repairing it became too costly for the city, and what's left of the iron woman can be found in the Depot Museum nearby. Standing in her place at Main St. and College is a polymer resin replica. She stands as a reminder to find the good in every situation, no matter how disastrous it may seem. Bon Secour and it’s waterfront is a living paradise to all animals: biped, quadruped, and those fantastic beasts in between. Residents of the area in the early 1900’s had to set traps to keep small animals away from their crops, out of their barns, and off their porches. So when a man found his raccoon trap mangled, he knew small pests were the least of his problems. Upon closer investigation, he noticed two bloody alligator toes, as if the beast had found himself caught in the trap and ripped it off at the cost of his back claws. The man nailed the toes to the side of his barn, partly for warning and partly for a conversation piece. The lore started growing wildly from that day, from a supernaturally fast gator catching livestock and disappearing back into the twisted oak canopies, to a gator running on two back legs in the cover of night running alongside speeding cars. “Be one the lookout for Ol’ Two Toe. He will steal your animals and chase your children. Shoot him on sight.” In 1930, a gator weighing about 1000 pounds and reaching 13 feet was caught after a hefty fight from the Cooper brothers. They bragged that they killed Ol’ Two Toe, and even chopped the foot off and preserved it in moonshine. Low and behold, the jar busted one day, and the secret was out. They had removed tow toes post mortem and sewn the wound shut. Ol’ Two Toe lived on. A stray Airedale mix wandered up to the door of Ken's Package Store in Rockford, Alabama. The dog was skinny, sickly, and dirty. Strangers nurses him back to health in 1993, and he knew he was home. Townspeople named him Fred, and he loved every one of them. He was given a bandana, and spotted all over the city. He was made Grand Marshall of the Fourth of July parade, he was mentioned on the sign coming into town, "Rockford, Alabama, home of Fred the town dog," he even had a regular column in the newspaper. Animal Planet had a feature on him. All for being a good boy. Fred passed away in 2002 from an odd animal bite that his elderly body couldn't heal, and was buried behind the Old Rock Jail. A proper gravestone was donated two years later, and that year he was inducted into the Alabama Animal Hall of Fame. In Wilcox County, a few miles north of the Rosebuds crossroads, there is an old rickety house, and it hasn't seen live for years. This house was supposedly used as a hospital in the late 1800's. What happened to the hospital or the bodies that lay to rest in the yard are uncertain. The only signs of their remains are the broken headstones jutting out of the earth like crooked teeth, and the dance their heads will do at night. Legend has it that in the attic of this abandoned house are the skulls of the people buried in the yard. Their heads are said to contain the trapped souls, needing to return to their bodies. So every once in a while, usually during a storm or other event of heightened energy, the heads will roll out of the attic and down the stairs, onto the porch and across the yard. The will hover over their body's grave and sway back and forth in mourning, unable to become whole again. The first Mardi Gras parade is legend to have started in Mobile, Alabama on New Year's Eve in 1830, when a group of men were celebrating by partying down the docks, stopping and drinking with every boat captain they came across. In their liquor soaked reveling, they noticed a hardware store across the way. They took off, raiding the store of shovels, rakes, cowbells, and anything that could possibly make a noise. This tradition carried for a few years before the men decided to give themselves a name. Cowbellion de Rakins Society. The first parading Mardi Gras organization was born. 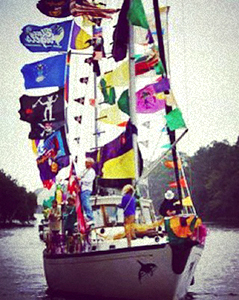 Orange Beach Alabama will be celebrating the 12th annual Mardi Gras Boat Parade this year. Sea captains transform their vessels into decked out floats and roll down the water with music and throws, trinkets and sweets. Nothing short of a show. The party sets sail from the Wharf and ends at Lulu's on Fat Tuesday, with a day-long party of live music and free cake.